The phase response curve (PRC) approach is a powerful tool in analyzing response of spiking cell to synaptic or other perturbations. 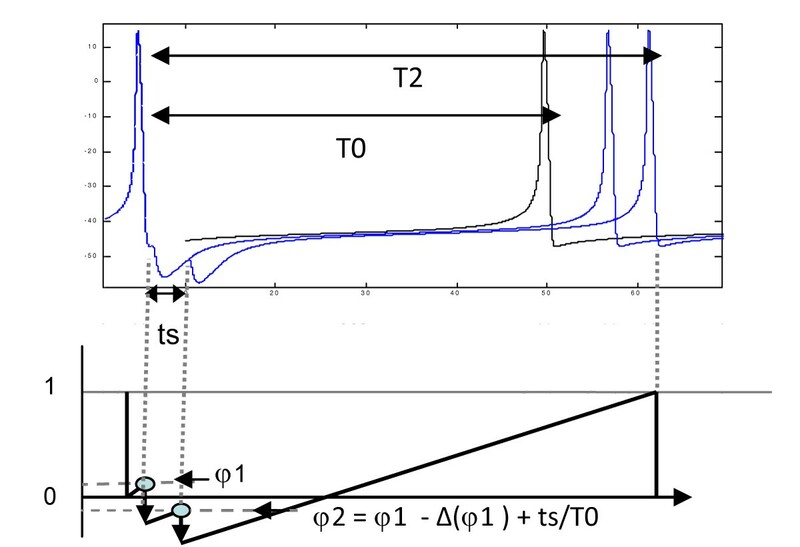 The PRC-based analysis of the cell response involves describing the effect of perturbation as a change of the phase variable characterizing the state of the spiking cell, whereby the phase is always bounded on the interval [0, 1] or [0, 2π]. However, the extension of phase domain to negative values naturally arises when deriving phase return maps in the case of non-weak inhibition or larger networks coupled by three or more cells, as previously shown by Canavier and coworkers [1, 2]. In our previous work , we have shown that for some biophysical models of spiking cells, a one-dimensional phase reduction of a non-weakly perturbed limit cycle oscillator may require the extension of the phase variable defining the state of the oscillator to a multi-branched phase domain. Such multi-branched domain is most easily implemented by extending the [0, 1] phase interval to negative values. The simplest illustration of such negative phase is provided by the integrate-and-fire model when it is hyperpolarized below its reset potential. This notion of negative phase enables us to extend the phase return map analysis based on the spike-time response curve (STRC) characteristic to describe novel dynamical states of non-weakly coupled oscillators, in particular the alternating-order spiking state. Here we examine the geometric meaning of such negative phase domain for the first time in terms of the phase space of the model and show that the extension of STRC to negative values of phase is necessary to accurately predict the response of a model cell to several close non-weak perturbations, as shown in Figure 1. Such an extended STRC can then be used to analyze the dynamics of three or more non-weakly coupled cells, whereby more than one synaptic perturbation arrives per oscillation cycle into each cell. Also, we reproduce the entire bifurcation structure of the Morris-Lecar network dynamics using the α-function STRC to examine a qualitative effect of changing the shape of STRC with negative phase domain. Effect of two close synaptic inputs for strong value of the coupling, g syn = 1.5. Since the first synaptic inhibition, Δ(φ1), is much greater than the phase φ1 and the second synaptic input is applied ts = 4 ms after the first input, the second phase, φ2, at the time of arrival of the next synaptic input is still negative (φ2 = -0.063). The second synaptic inhibition, Δ(φ2), at the negative phase, φ2, is accurately predicted using the STRC extended to negative values of phase. This work is partially supported by the National Science Foundation grant DMS-0417416.